Milledgeville, GA... January 20, 2016... 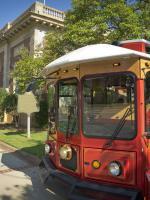 In honor of Black History Month, the Milledgeville Convention and Visitor&apos;s Bureau will be offering a free African-American historic Trolley tour on Sunday, February 14th and 28th from 2:00 p.m.-4:00 p.m. The tour will highlight the African-American heritage of Milledgeville where religion flourished, education grew and influential men and women left their mark on the Antebellum Capital.